Outside Amalie Arena between the two semifinal games. In between what was two very good semifinal games at the Frozen Four this year, was a situation of NCAA manufactured chaos. At the end of game one, it was announced that every fan inside the arena would have to leave, stand around for 30 mins or so, and then reenter. It was met with an attitude that suggested this was the dumbest thing any of us had ever heard. None of us could figure out what kind of mushroom the college officials had been eating. When I first started to attend the Frozen Four, there was enough time between the two Thursday games, to leave the arena and find a nice local place to have a meal before the second game began. But ESPN didn’t like the delay, and the NCAA likes to keep their financial backers happy, so they changed the setup so that there was one hour between the two games. Not enough time to go out and get a beer, let alone a meal, so fans have been stuck paying the outrageous prices for crappy food inside of the rink. Let’s be honest Ms. Fasbender, and get down to the nitty-gritty. Up until this year, four sections in the corners have been for the students and fans of the four teams competing in the tournament. But that is such a waste, after all, this tourney is not for the fans or the students. So some pencil pushing, cubicle dwelling NCAA official, came up with the bright idea that they could get by using only two sections for those fans, therefore selling tickets to the other two sections for more money. Since the NCAA has not reached the point of putting two people in one seat yet, they had to force everyone outside and reseat those in the two student sections. As stupid as this whole incident was, other than some grumbling and mocking of the NCAA, I would have let it go, but I took exception to Ms. Fasbender placing the blame for this on 20 year priority customers. I, for one, would love to go back to the time when we started Game One in the early afternoon and we had several hours between games, but television rights will never allow us to go back to that. With the second game puck drop scheduled for 8:30pm, which was late enough, it’s inconceivable that anyone thought they could empty 18,000+ people out of an arena and get everyone back in and seated in an hour. There was no time to do anything but stand outside and wait to reenter. 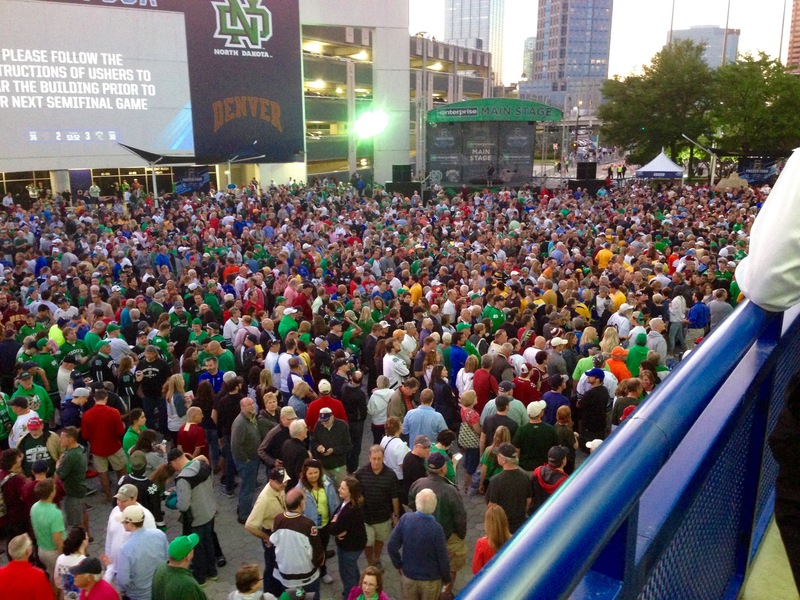 With 18,000+ people headed outside, did the NCAA really think a couple of food trucks and a few soda stands would be enough to take care of everyone? After talking to members of the Amalie Arena staff, and even a couple of Tampa Bay police officers, I am confident that they could handle letting those fans who want to go outside to do so, and then reenter in what would have been an orderly fashion, if your intent was to let fans go outside. But that wasn’t really your intent, was it? When you hire experts to host your events, maybe the NCAA could put a little trust in their ability to do their jobs, and listen to the advice they offer. And NCAA, next time don’t blame your most loyal customers when you screw up. 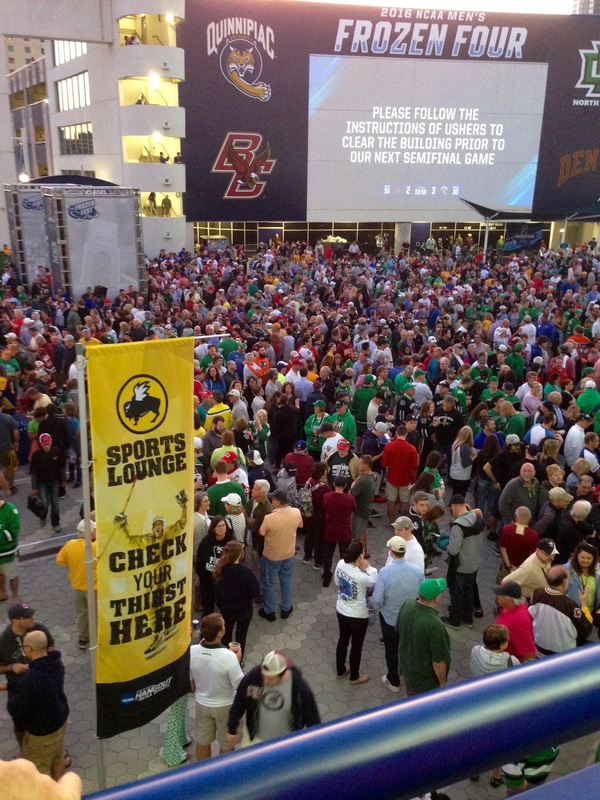 This entry was posted on Monday, April 11th, 2016 at 11:32 PM	and tagged with frozen four, hockey, insanity, ncaa, photo, travel and posted in sports. You can follow any responses to this entry through the RSS 2.0 feed.